I recently read a short, but powerful book. I originally saw it in a Kinkos and probably over a year later got around to actually reading it. I was going to be taking a short plane trip and wanted something I could easily finish. Debra Fine's The Fine Art Of Small Talk slid right to the top of the list. The book starts out recognizing that everyone is afraid of being stuck in a situation where they don't know anybody. Where you literally have to start up a conversation with a complete stranger. You absolutely wish somebody would come along and take YOU out of your misery by simply starting up a conversation with YOU. The great revelation is that YOU can be that somebody that rescues somebody else, and in turn rescues each other. 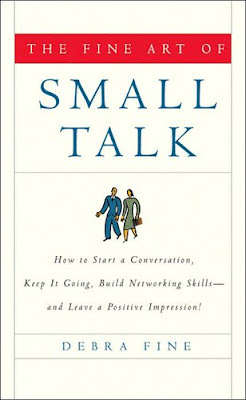 The book then goes on to give advice and tips to make it easier to be that person who succeeds in small talk. Do take the risk and introduce yourself to others. Don't use nicknames without permission! Do make people feel special by using their names during conversation. Do ask a person's name if you've forgotten it. Do prepare icebreakers that show a genuine interest and are tailored to the occasion or situation. Do "play the conversation game," offering information about yourself and your activities so others can learn about you. Do practice an "elevator speech," offering a couple of interesting sentences about your work. Do use humor whenever possible to overcome uncomfortable moments. Don't tell jokes unless you're a master joke teller. Do get excited about other people's activities and interests. Don't melt away from conversations. Do issue invitations to continue relationships. Do regularly stay in touch with those you meet. Do keep track of what you learn about people so that you can use that information in future communications. Do use open-ended questions such as, "tell me about..." and "How did you come up with that idea?" to jump-start a conversation. Do come prepared to change topics if a conversation has lost steam or encounters a roadblock. Do compliment others about their behavior, possessions, or appearance. Fine has many more which are just as good. The book is a quick read, and it is worth reading.